According to a French investigation report, the runway excursion incident involving a Boeing 737 in August 2009 was caused by the premature application of thrust during a rolling takeoff. On August 29, 2009 an Air Algérie Boeing 737-8D6 departed the right side of runway 36L at Lyon-Saint-Exupéry Airport (LYS/LFLL), France during takeoff. It rolled for about 250 meters on the grass verge alongside the runway. The aircraft joined the track after hitting a runway edge light and continued the takeoff. On arrival in Sétif-Ain Arat Airport (QSF/DAAS), Algeria, minor damage was found on the right engine, the airframe and nose gear. There were 39 passengers and seven crew members on board. The BEA report states: “The overrun is due to a non-compliance with the procedure of “rolling takeoff” by premature application of takeoff thrust as the aircraft, light and with a rear centre of gravity, had not yet entered the runway. 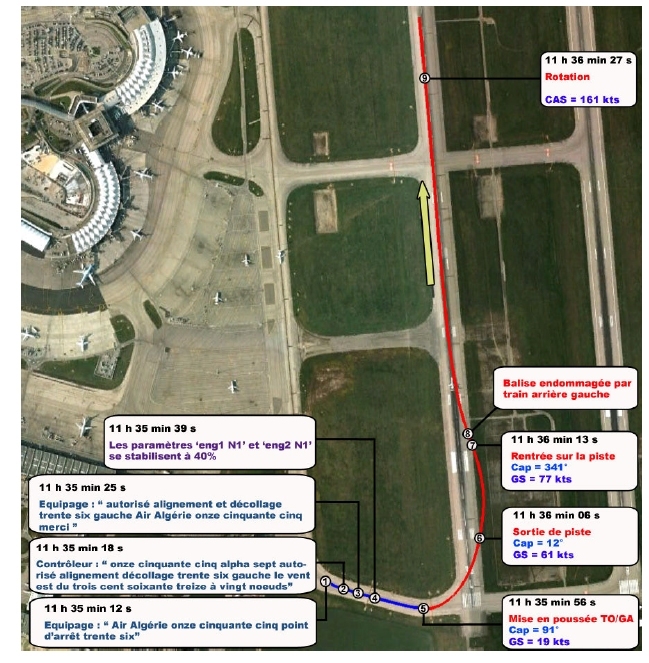 A possible tendency of the Pilot Flying to add thrust before the complete alignment of the aircraft on the centreline of the runway contributed to the occurrence of this serious incident. The Accident Investigation Board of Norway published its final report of their investigation into a serious incident involving an Airbus A321 at Sandefjord Airport Torp (ENTO), Norway. An Airbus A321, registration OY-VKA and flight number VKG866, flew from Tenerife Airport (GCTS) to Sandefjord Airport Torp (ENTO) on 26th of March 2006. The flight was operated by My Travel Airways Scandinavia. The first officer was Pilot Flying (PF) and the commander was Pilot Not Flying (PNF). The crew reviewed updated weather and runway status before commencing the approach to ENTO. Air Traffic Information Services (ATIS) indicated dry runway and Braking Action (BA) GOOD. When checking in on Tower frequency, the crew was informed that the runway was contaminated by 8 mm wet snow with a measured (Friction Coefficient, FC) of 32-33-31. These numbers indicated a MEDIUM BA. The crew requested wind information in order to check for any crosswind or tailwind limitations. They made a mental consideration regarding the landing conditions and decided that it was acceptable to perform the landing. The airplane got high on the glide slope after passing 250 ft Radio Height. This resulted in a touch down approximately 780 metres from the threshold. After landing the crew experienced POOR braking action and suspected auto brake failure. The first officer performed maximum manual braking without noticing any BA. After landing the crew experienced POOR BA and suspected a brake failure. The commander took control, pulled the Park Brake (PB) and steered the aircraft with Nose Wheel Steering (NWS) towards the left side of the runway with guidance from the first officer. The effect of the PB and NWS was that the aircraft skidded sideways towards the end of the runway 18. This resulted in increased deceleration and the aircraft stopped at the very end of the hard surfaced runway, with the nose wheel against a concrete antennae base. The crew advised the TWR about the anticipated runway excursion while the aircraft skidded towards the end. This allowed the TWR to alert the fire and rescue crew even before the aircraft had stopped. The fire and rescue service functioned as expected. No persons were injured and the aircraft got some skin and nose wheel damage. The commander shut down the engines and evacuated the passengers through the forward left cabin door. The passengers were transported to the terminal building by buses while the crew remained in the aircraft being towed to the terminal. AIBN issued three safety recommendations to MyTravel Scandinavia (now Thomas Cook Airlines Scandinavia) and two recommendations to Sandefjord Airport Torp, related to operations on contaminated runways. The Australian Transport Safety Bureau (ATSB) released the final report AO-2007-044 of their investigation into a serious incident during a go around involving an Airbus A320 at Melbourne, Australia. On July 21, 2007 an Airbus A320-232 aircraft was being operated on a scheduled international passenger service for Jetstar between Christchurch, New Zealand and Melbourne, Australia. At the decision height on the instrument approach into Melbourne, the crew conducted a missed approach as they did not have the required visual reference because of fog. The pilot in command did not perform the go-around procedure correctly and, in the process, the crew were unaware of the aircraft’s current flight mode. The aircraft descended to within 38 ft of the ground before climbing. The aircraft operator had changed the standard operating procedure for a go-around and, as a result, the crew were not prompted to confirm the aircraft’s flight mode status until a number of other procedure items had been completed. As a result of the aircraft not initially climbing, and the crew being distracted by an increased workload and unexpected alerts and warnings, those items were not completed. The operator had not conducted a risk analysis of the change to the procedure and did not satisfy the incident reporting requirements of its safety management system (SMS) or of the Transport Safety Investigation Act 2003. As a result of this occurrence, the aircraft operator changed its go-around procedure to reflect that of the aircraft manufacturer, and its SMS to require a formal risk management process in support of any proposal to change an aircraft operating procedure. In addition, the operator is reviewing its flight training requirements, has invoked a number of changes to its document control procedures, and has revised the incident reporting requirements of its SMS. In addition to the safety action taken by the aircraft operator the aircraft manufacturer has, as a result of the occurrence, enhanced its published go-around procedures to emphasise the critical nature of the flight crew actions during a go-around. 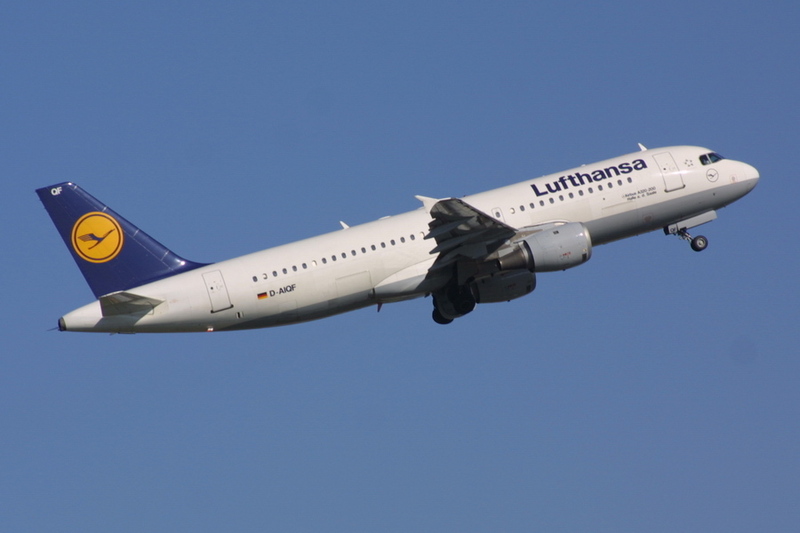 The German Federal Bureau of Aircraft Accident Investigation (BFU) released the final report 5X003-0/08 of their investigation into a serious incident involving an Airbus A320 at Hamburg Airport in March 2008. The left wing of the A320 had made contact with the ground during an attempted cross-wind landing. 2 passengers. Given the ATIS weather report including wind of 280°/23 kt with gusts of up to 37 kt, during the cruise phase of the flight the crew decided on an approach to Runway 23, the runway then also in use by other traffic. During the approach to land, the aerodrome controller gave several updates on the wind. 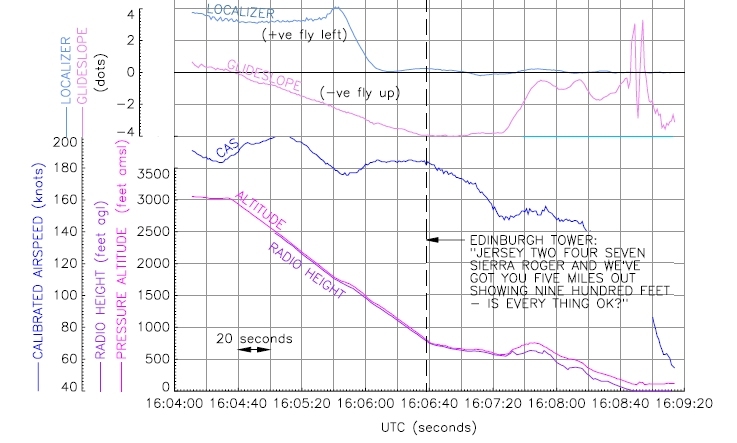 Immediately prior to touchdown, the wind was reported as 300°/33 kt, gusting up to 47 kt. At the time of the decrab-procedure there was no significant gust. The initial descent was flown by autopilot and the co-pilot assumed manual control from 940 ft above ground. After the aircraft left main landing gear had touched down, the aircraft lifted off again and immediately adopted a left wing down attitude, whereupon the left wingtip touched the ground. The crew initiated a go-around procedure. The aircraft continued to climb under radar guidance to the downwind leg of runway 33, where it landed at 1352 hrs. No aircraft occupants were injured. The aircraft left wingtip suffered damage from contact with the runway. During the final approach to land the tower reported the wind as gusting up to 47 knots, and the aircraft continued the approach. In view of the maximum crosswind demonstrated for landing, a go-around would have been reasonable. The limited effect of lateral control was unknown.